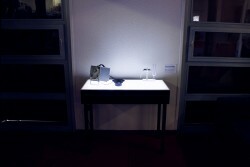 Frequencies (a / friction) is a sonant art installation. 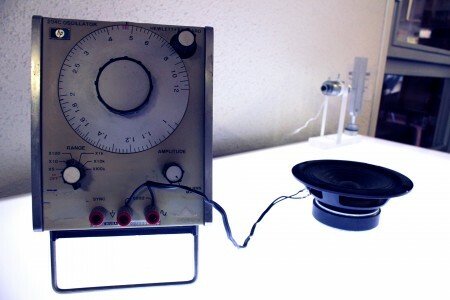 Numerous elements are scattered across a lit table: an old oscillator, connected to a speaker continuously broadcasting a sound at a fixed frequency of 476 hertz, along with a tuning fork whose frequency is 480 hertz. 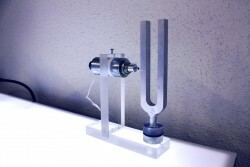 The tuning fork is hit at random intervals by a solenoid (piston engine) placed nearby. A ringing emerges from this impact, underscored by the bight light emitted by the table, and it hangs in the air. The two frequencies, that of the oscillator and that of the tuning fork, seems at that moment to come together, and an acoustic beat effect arises. The listener then discovers the friction between these two oscillations, between the electronic sound and the acoustic sound. The piece is a double homage to the American composer and sound artists Alvin Lucier who, since the 1960s, has worked intensely with oscillators, and to the German physician Hermann von Helmholtz, who used tuning forks to sound analysis and who was, from the second half of the 19th century, among the first to theorize the patterns of the beat frequencies. Frequencies (a / friction) is a central part of a series of installations and performances by Nicolas Bernier revolving around the phenomenon of sound frequency and pure sounds emitted by tuning forks, among other things. Nicolas Bernier (1977-) is a Canadian artist. He works in numerous areas: performances, installations, music concrète, noise improvisations and video art, all the while accumulating collaborations with dance, theater, moving images, and privileging interdisciplinarity. At the heart of this eclecticism remains one constant: the search for a balance between being cerebral and sensual, and between organic materials and digital processing. He is a member of the Perte de Signal [Loss of Signal], a center for production, research and development of digital art projects.